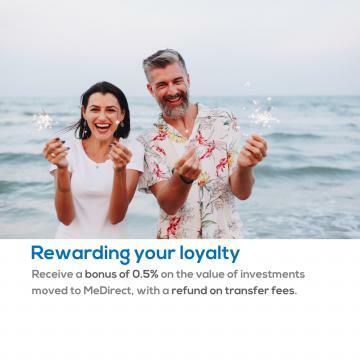 MeDirect is rewarding its customers’ loyalty with a new asset transfer promotion. This will give customers a 0.5 per cent bonus on the value of investment securities transferred from local or foreign banks or brokers to MeDirect, by November 30, 2018. In addition, MeDirect will refund third-party transfer fees of up to 0.5 per cent of the value of investments transferred. Both the bonus and refund will be paid by December 31, 2018, making for a rewarding end-of-year gift. MeDirect is trusted by over 50,000 customers, and administers €2 billion deposits and €1 billion assets on their behalf. Its high rate of customer retention is built on the solid foundations of superior customer service, professional expertise and state-of-the art technology to offer low-cost banking services. MeDirect customers can view and manage all their savings and investments together on one online account, accessible 24/7 in a completely secure way. Its low banking and investment fees enable customers to save money when trading and executing banking transactions, and to retain a higher share of the returns made of their investments. MeDirect offers a wide selection of investment products, including funds, ETFs, shares, bonds as well as Model Portfolios, which are baskets of investment funds aimed at diversifying investment risk and achieve better returns. With branches in Sliema, Paola, Mosta and Gozo, a Belgian online bank, a London-based team of analysts, and the expertise of Charts - whose wealth management team operates in Malta since 1985 - MeDirect can effectively support its customers in choosing the investment strategy that better fits their needs. Customers interested in taking advantage of the promotion can visit one of MeDirect branches or login to their online banking to open an investment account. Once this is done, they need to submit a transfer request together with a statement of holdings, showing their current portfolio. MeDirect will then contact the existing investment custodian to arrange the transfer. New and current MeDirect customers can contact MeDirect by phone (+356 2557 4400) or via e-mail info@medirect.com.mt to schedule an appointment with one of its branch representatives and kick-start their asset transfer process. For more information about the promotion, read the ‘Terms and Conditions of the 0.5 per cent Asset Transfer Promotion’ on the MeDirect website.